Steeped in history this camp dates back to the 1950s. The busy waterhole is a hotspot for leopard at night. Enjoy breakfast and dinner on the riverbank. Spectacular game viewing from camp. On a sweeping bend of the river, 12 kilometres north of Tena Tena, lies Nsefu. 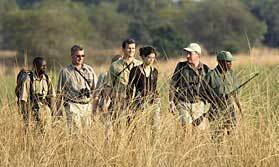 Owned and run by Robin Pope Safaris, Nsefu was the first game camp in Zambia and dates back to the early fifties. The Nsefu Sector was recognised then as a phenomenal area and it still is. 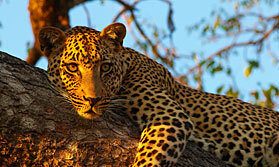 It is the only area of the national park which is actually on the east side of the Luangwa river. The camp was re-opened in 1999, in keeping with the original style, and RPS now operate the only two camps in the Nsefu Sector of the park. It is possible to walk between the two. The view of the river is superb and includes a terraced area where game grazes during the day. The bar, tucked in beside a huge dormant termite mound, overlooks a waterhole that is very productive for game, especially leopard at night. The original rondavels (round rooms) have been extended, with a spacious open air bathrooms added. Each room has a clear view of the river, through large windows and from the new wooden veranda. A maximum of 12 guests are accommodated here. Meals are taken mainly outside, though the shade of the bar area is used at lunchtime. Dinners and breakfasts are served on the river bank. Open: Late Jan to March and late May to November (Specific dates each year - please ask for details). Location: On the banks of the Luangwa River deep in the Nsefu sector of the park. the nearest airport is Mfuwe,a 75 minute drive from the camp. Rooms: 6 luxury rondavels with verandas overlooking the river. Activities: Day and night game drives, guided walking safaris, village visits, boating safaris (seasonal) and birdwatching. Facilities: Comfortable lounge and bar areas overlooking small seasonal waterhole and a separate thatch dining area with sweeping views of the river. The camp is run on solar power and has a backup generator for cloudy days. tap water is from a borehole and is safe for drinking, although bottled water is also provided to guests free of charge. Dining: Meals are served communally in the thatch dining area or under the stars. Children: The camp accepts children 12 years of age and over. As the camp is unfenced, children need to be supervised at all times. Communication: There is very limited mobile reception, no direct ‘phone or fax and no internet. Nsefu belongs to Robin Pope Safaris. They are an award-winning company in terms of responsible tourism. They believe in benefiting the wildlife, environment, the people who work for them and their neighbouring communities.
" I saw loads of game in this area, and even more around the camp. 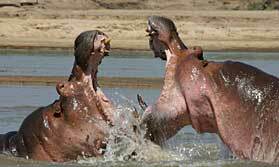 While relaxing in the bar there were a number of warthogs, baboons, giraffeâ€™s and impala playing in the waterhole. Then a family of elephants crossed the river while we were having lunch, we didnâ€™t even need to leave the camp to do some game viewing. "It's good to be aware that the rondavels are quite small (compared to other Luangwa camps) and there is not much space between them, however this is basically a site of historic importance and as such cannot be changed. This is the oldest camp in the valley - and unique. The location on a bend of the river is lovely and the wildlife sightings around here are superb. If you stay here several nights take a trip to Kawaza village for some cultural interaction and a break from dusty safaris!"